Why do I need an API key? To make the "API" term more understandable let us explain that it stands for an application programming interface key. It allows you to connect our or any app with the one you are using in a very direct and internal way. The API key often constitutes both a unique identifier and a secret token the authentication. If you care for some details about how API works in a nutshell, just imagine that each app is written in a language which may be metaphorically compared to a socket. Now, to be able to communicate with this app, you need a plug-in which will fit. This is what you'll find here – a set of connectors and potential actions to make your Woodpecker account able to plug-in to any other app. If there is some information we forgot to mention, don't hesitate to let us know! All feedback helps us grow. Now you have your API Key ready to use. Great! 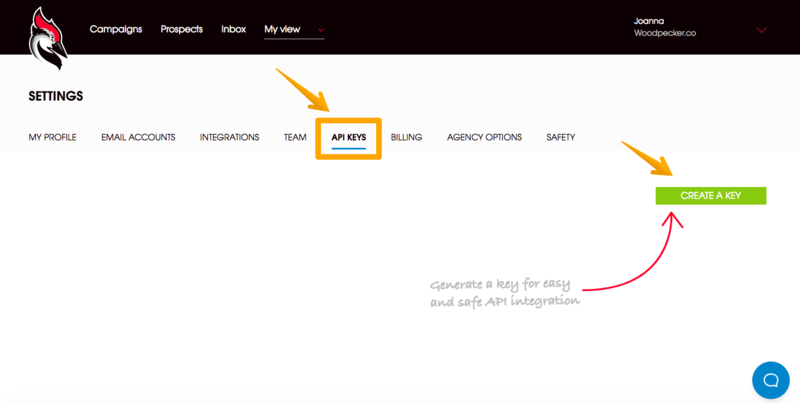 If you need more than one API key feel free to get it in the same way as described above. If you are a Woodpecker Chrome Plugin user, you can find more help here.